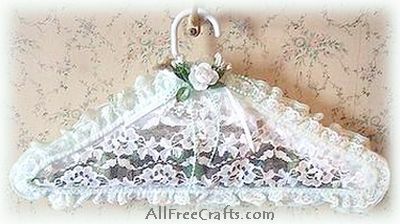 This lace covered, scented clothes hanger is so pretty and feminine, it would be perfect as a wedding shower gift. It would also be appreciated by almost any other woman in your family, from grandmas and great-aunts to teenagers and new moms. No sewing required – just load up your glue gun and go! 1. Lay the clothes hanger on a sheet of newspaper and trace around the main body of the hanger to make a pattern for the lace front of the hanger. Repeat this process, adding a half inch all around to make a pattern for the back panel of the hanger. 2. Pin each pattern piece to fabric lace and cut out. Set aside. 3. Cut a strip of polyester batting to pad the upper shoulders of the hanger. Use hot glue to secure the batting in place. 4. Place the back panel lace on a flat surface, with wrong side facing up. Lay the hanger on top of the pattern. Heat up the glue gun and begin securing the back lace piece to the hanger and batting with hot glue, bringing the lace edges over to face the front as you go. 5. Once the back lace panel is secured to the hanger, pour your choice of potpourri into place, then cover with the front lace panel, using the glue gun to secure it all around the hanger. 6. Beginning at the base of the hanger hook, glue a length of pre-gathered ruffled lace all around the hanger body, covering up the glued seams of the back and front lace panels. 7. Make a bow from thin ribbon and glue to the base of the hanger hook. Glue a white rose, or your choice of floral decoration, on top of the bow. 8. Tie a strand of string pearls around the floral decorations, letting the ends hang down across the front of the lace covered hanger. » You can color coordinate this craft project: use ruffled lace with a hint of mauve or lilac shades for lavender scents; choose reds, rose, or pinks for rose scented potpourri. » When the potpourri scent fades, replenish it with a spray of your favorite perfume or by sprinkling a few drops of essential oil or fragrance oil through the lace to infuse the potpourri.